All great universities are built on the excellence of their faculty -- faculty whose work changes the boundaries of our knowledge, and whose teaching bears fruit through the accomplishments of their students. 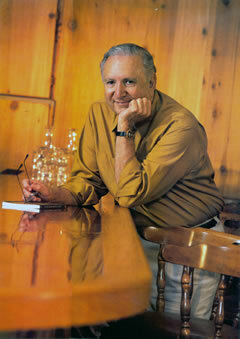 Lester Goran is the paradigm of a great teacher and the highest example of a true American writer. Since 1960, Goran has had an enormous impact on the University, his students, and the community. In 1965, Goran helped to establish the first creative writing curriculum at UM. He served as a faculty representative and then later as Chairman on the UM Publishing Board and oversaw all publications from literary magazines to the Hurricane, UM’s student paper. In 1991, he was instrumental in organizing and establishing the MFA Program and was the first to welcome our graduate students in 1992. Throughout his teaching career, Goran has taught more than 20,000 students and still has continued to produce a prolific list of novels and short story collections. Among his students are successful writers like Chantel Acevedo, Michelle Richmond, Terrence Cheng, Tom Cavanagh and Crissa-Jean Chappell, but he has also influenced many notable citizens such as Probate Judge Arthur Rothenberg and Mayor Juan Carlos Bermudez of the city of Doral. Professor Goran continues to inspire and guide UM’s young writers. As we launch a year-long celebration of Lester Goran’s career, we invite you to get to know Lester, his books, his students, and their accomplishments.